Author's Note: Today I have a guest blogger. Dakota is my 2-year-old yellow lab. She was a 2014 April Fool's joke that quickly turned into a foster situation. Her peaceful, honey-colored eyes and sweet, quiet temperament ultimately won us over and she became a permanent member of the Nahrstadt family. Occasionally she'll have thoughts to share. Here's her first post...from under the Blue Table. I am feeling wonderful after a trip to the lake. Jenn takes me there every day to swim. Today, I rolled to my heart's content on a dead fish carcass. It was stink-a-licious! It's way better than rolling with dead worms on the driveway after a good rain. There is a blue table at our house. The blue table is very right for Jenn, but all wrong for Bob. For me, it's a great spot. Not roll-in-dead-fish-carcass great, but great, all the same. I typically don't wade into the discussions between Jenn and Bob because sometimes a third opinion only makes things more confusing. Jenn didn't ask how I felt about the blue table, and I don't think she needed me to take her side. She simply wanted me to be nearby, and everyday since then I relax on my special place she created with Michael's old sleeping bag while she writes. 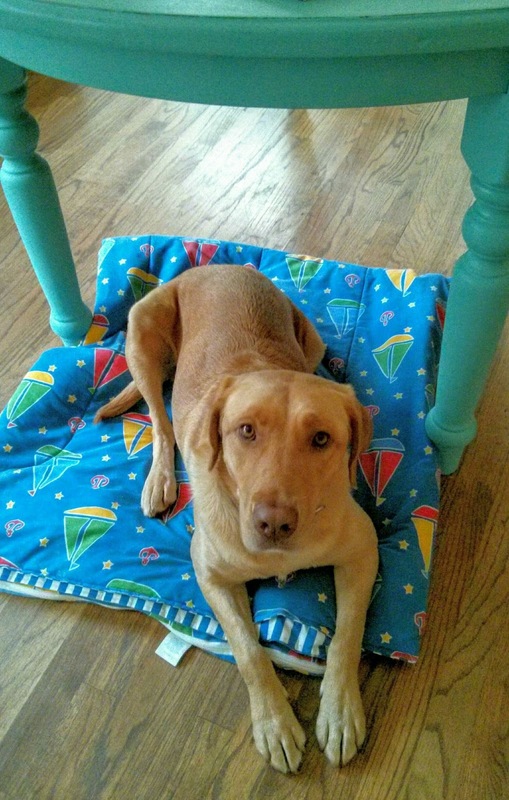 On the day the blue table arrived, I could've taken Jenn's side and growled at Bob or chewed up one of his shoes. But it wasn't about pairing off. It wasn't about taking sides. It wasn't about protecting Jenn. She didn't need me to judge her decision or her taste in furniture. She just needed my support. And, for the record, Bob has changed his mind about the table. But he won't lay under it. Do you find it hard to simply be near someone without judging their decisions? Is it harder for you when they smell like a dead fish?